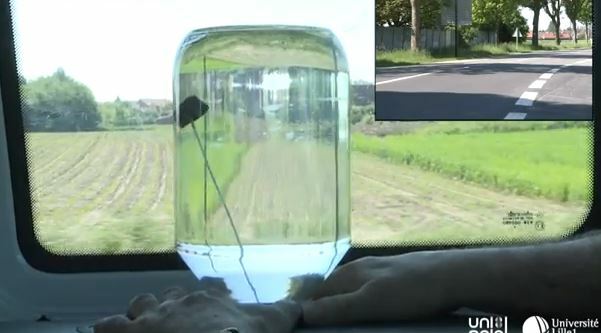 Un pot de verre rempli d’eau et un bouchon maintenu par une ficelle fixée au fond de ce pot suffisent pour visualiser l’accélération subie par une voiture en mouvement : le bouchon s’incline vers l’avant si la voiture accélère en ligne droite, et vers l’intérieur de la courbe si elle emprunte un rond-point. Une expérience très instructive et facile à réaliser. A slinky is an example of a tension spring: in an unstretched state a slinky is collapsed, with turns touching, and a finite tension is required to separate the turns from this state. If a slinky is suspended from its top and stretched under gravity and then released, the bottom of the slinky does not begin to fall until the top section of the slinky, which collapses turn by turn from the top, collides with the bottom. 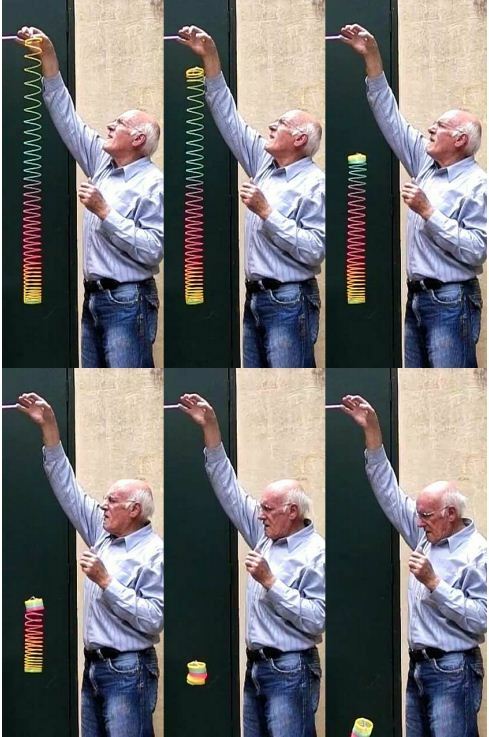 The total collapse time t_c (typically ~0.3 s for real slinkies) corresponds to the time required for a wave front to propagate down the slinky to communicate the release of the top end. 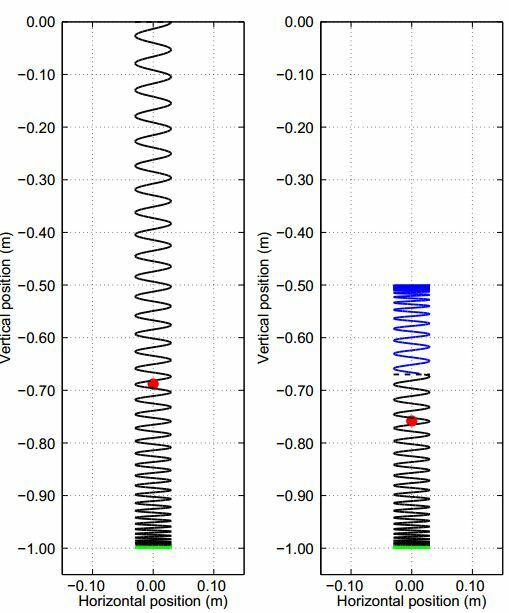 We present a modification to an existing model for a falling tension spring (Calkin 1993) and apply it to data from filmed drops of two real slinkies. The modification of the model is the inclusion of a finite time for collapse of the turns of the slinky behind the collapse front propagating down the slinky during the fall. The new finite-collapse time model achieves a good qualitative fit to the observed positions of the top of the real slinkies during the measured drops. The spring constant k for each slinky is taken to be a free parameter in the model. The best-fit model values for k for each slinky are approximately consistent with values obtained from measured periods of oscillation of the slinkies. (color online) Schematic view of the Tarzan swing motion. Tarzan initially stands on the platform (A). He swings from this point and reaches the swing nadir (B), from where he swings ahead to the launching point (C), where he releases the rope to achieve as long a ﬂight distance as possible to reach the landing site (D). All the variables and constants used in the present article are displayed. The tree-based rope swing is a popular recreation facility, often installed in outdoor areas, giving pleasure to thrill-seekers. In the setting, one drops down from a high platform, hanging from a rope, then swings at a great speed like “Tarzan”, and finally jumps ahead to land on the ground. The question now arises: How far can Tarzan jump by the swing? In this article, I present an introductory analysis of the Tarzan swing mechanics, a big pendulum-like swing with Tarzan himself attached as weight. The analysis enables determination of how farther forward Tarzan can jump using a given swing apparatus. 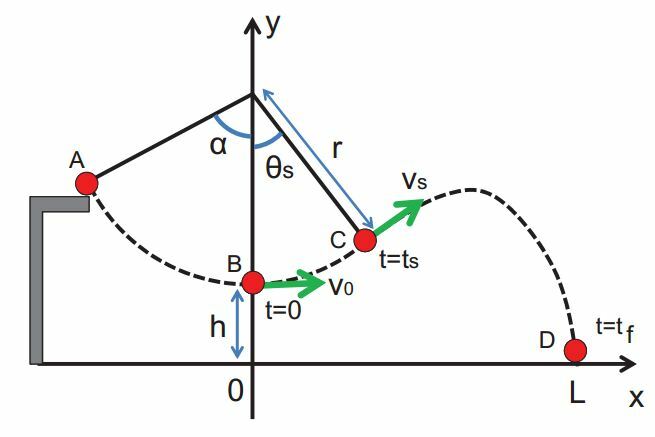 The discussion is based on elementary mechanics and, therefore, expected to provide rich opportunities for investigations using analytic and numerical methods. In a multibillion-dollar sport like basketball, one might expect trainers had figured out every nuance of aerodynamics, mechanics and all things Newtonian to increase the rate at which the ball goes through the hoop. Think again. Take free throws. For 50 years professional players in the United States have sunk these shots from the “charity line” – so called because the points are supposedly such sure things they’re gifts – at a rate of about 75 percent. That figure seems to reflect a fundamental limit on human performance, like a three-minute mile. But mechanical engineer Larry Silverberg of North Carolina State University doubts it. He believes the reason free throw percentages are not higher is that no one had properly analyzed them to determine the optimal trajectory. Using a computer simulation of millions of trajectories based on shots by the best free-throw shooters, Silverberg and colleague Chau Tran determined how various factors affect the chance of success. The magic formula: a launch angle of 52 degrees, 3 revolutions per second of backspin, and aiming for a spot 7 centimeters (2.8 inches) back from the center of the basket, toward the back of the rim. Backspin that exceeds 3 revolutions per second is even better: at 9 rps, Silverberg and Tran calculated, a free throw that hits the very top of the backboard will drop straight down for a point. But 9 rps is too difficult for players to achieve. The target point is even less intuitive. Many players aim for the center of the basket, assuming “nothing but net” makes success more likely than hitting the rim, which can produce unpredictable bounces. The NCSU scientists’ calculations show that the spot that maximizes the chance of a field goal is 2.8 inches behind the center of the 18-inch-across basket. That puts the back of the ball just over an inch from the back of the rim. The main reason that target is better than the net’s center is that shooters aren’t perfect. Aiming for the center of the basket increases the chance of hitting the front of the rim and having the shot drop straight down. Finally, the launch angle, or arc. A launch angle of 52 degrees minimizes velocity compared to shots with more arc or less arc. Less velocity means less chance of a rebound that misses the basket. The millions of shots that went into Silverberg’s simulation showed that 52 degrees produced the greatest chance of sinking the shot for a 6 foot, 6 inch player. Since players can’t easily tell the angle at which they’re launching a free throw, a more useful strategy is to shoot so the top of the ball’s arc is even with the top of the backboard. That’s doable with practice, and works no matter a player’s height. The NCSU computer simulations also filled a gaping hole in basketball wisdom: although lay-ups and bank shots off the backboard are the most common shots in basketball, no one knew with any certainty the optimum spot on the backboard for making the ball drop in for two, or three, points. Simulations showed that the optimal banking points varied with the location of the shooter, as expected. Completely unexpected was that these points form what Silverberg calls “a magical location: a ‘V’ near the top of the shooter’s square,” the rectangle above the basket that’s painted or taped on the backboard. To determine where on the V a bank shot should hit to have the greatest chance of going in, a shooter imagines a vertical line behind the backboard. Where it intersects the imaginary V on the backboard is the sweet spot where a bank shot should hit to score a basket. A player can’t do all of this mental imagery in the frenzy of a game, of course, but by doing it in practice he can get an intuitive feel for where to aim from different points on the court. “It’s a training tool,” said Silverberg. 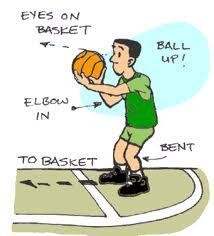 From near the free throw line – that is, in front of the basket – the ideal bank point is lower; from the sides of the court it’s higher.